Please log into your SCBWI account to register and receive your discount! Not yet a SCBWI member? Go ahead and book below! Or join now for the members’ only discount! Do I have to pay with PayPal? PayPal is just the tool we use to receive credit card payments, you don’t need a PayPal account (unless you want one). 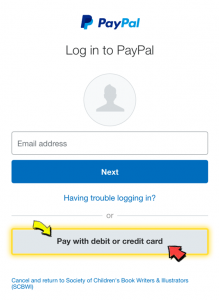 Click on the link “pay with debit or credit card” (see right) and follow the prompts to avoid PayPal and it will lead you through the process. Want to review your booking? 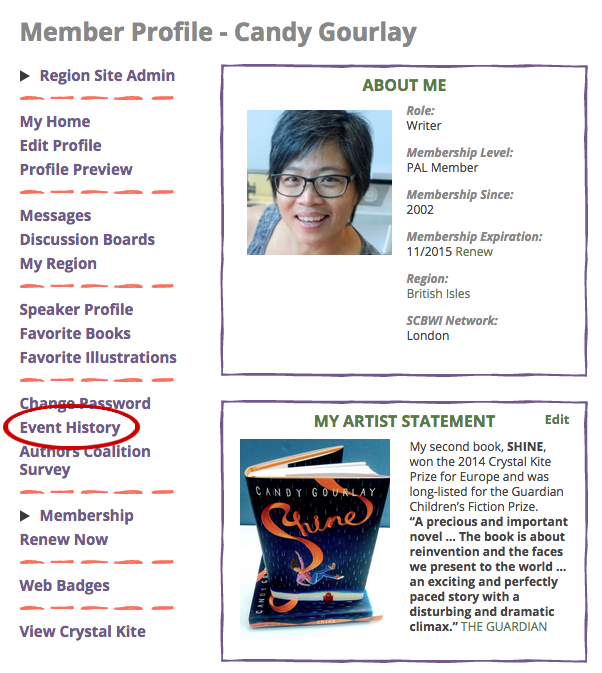 Log in to your SCBWI member home page and check out your event history. Can I sell my book at the conference? Yes! Both published and self-published authors and illustrators, attending the conference, can nominate one title on the booking form. Our bookseller P&G Wells will endeavour to stock your title alongside the titles nominated by our conference speakers and faculty. Please be aware however, this will be subject to availability. We cannot guarantee all titles will be available. 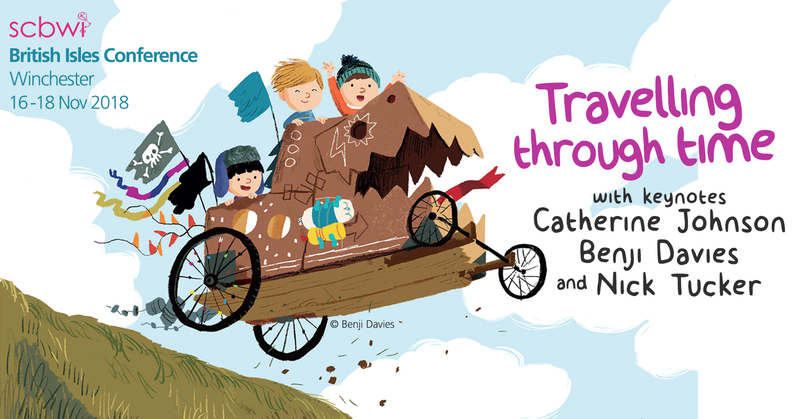 We request all nominated books have a clear connection to children’s literature, even if they are not aimed at young people. If you don’t have a book to sell yet, then simply fill the registration form with NAs. There are many pre-published authors and illustrators attending. That’s why we hold the conference. You’ll get there one day! Please use the link below. When booking by tablet or phone please tilt to landscape to avoid any difficulty seeing the whole form. Cheers. Reminder: The programme is subject to change without forward notice. Please note that unless we cancel the event, we are unable to refund any tickets already paid for.